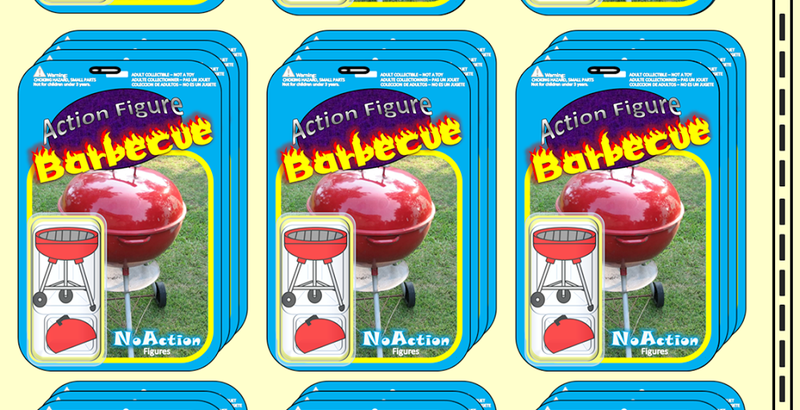 Action Figure Barbecue: Toy Bloggers United Contest Part 1: October 1st: When did you realize that you still loved Halloween? 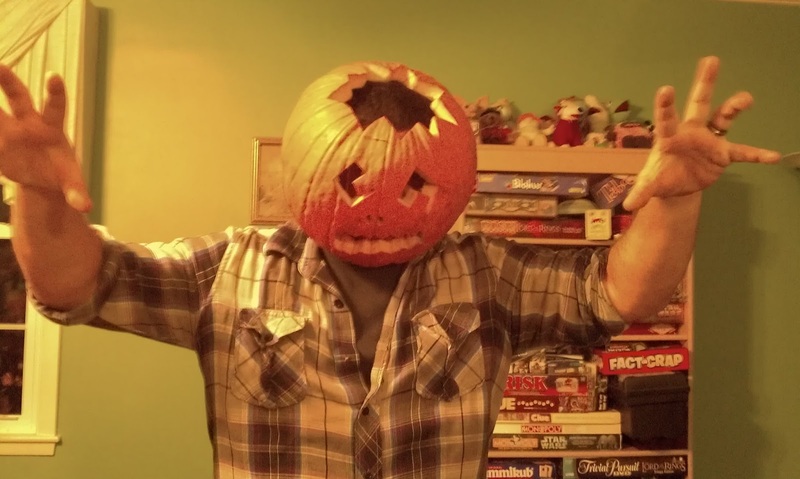 Toy Bloggers United Contest Part 1: October 1st: When did you realize that you still loved Halloween? If you're new around here, hello! My name is Barbecue17 and I still love Halloween. When I mentioned above about someone deciding that Halloween should be celebrated from August 1st through November 7th? That's me (my wife still hasn't come to terms with that yet)! I'm proudly one of the co-creators of Re-Halloween and me and my buddy Andrew are also working on Halloween in May. Expect to be celebrating it sometime in the next few years! It's gonna be huge! Let me tell you about what I now refer to as the dark times... the year without a Halloween! It was Halloween, I was a Junior in high school, and I didn't really have any plans. I decided to go over to a friend's house who was having a Halloween party and so I through a costume together. When I got there, no one else was dressed up. No one! There weren't even decorations! No spooky music was playing. What was really the pea soup vomit of the evening, though, was that 5 minutes after someone put on one of the Roger Corman Edgar Allan Poe films, everyone wanted to turn it off to watch Bicentennial Man. Flipping Bicentennial Man. On Halloween. That my, my friends, it when I realized that I couldn't tolerate another mediocre Halloween! 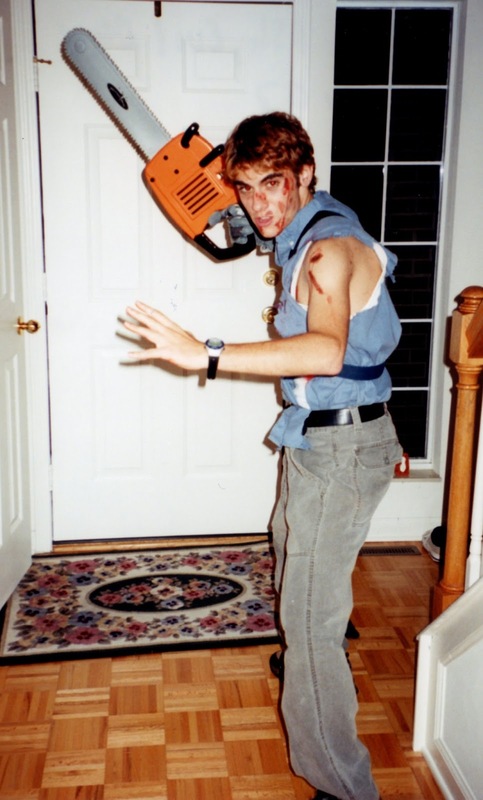 Here's your old pal Barbecue17 the next year on Halloween as Ash from Army of Darkness. I'm not that slim anymore and I generaly have less blood on me. By this time I'd already been to multiple haunted houses, a 1/2 dozen corn mazes, I'd drank enough Mountain Dew Pitch Black to fill a bathtub, eaten my weight in fun-size candy bars, and watched enough horror movies to fill at least 1/2 a season of Monster-Vision with Joe Bob Briggs. From then I've continued to find ways to celebrate and have some ghoulish fun every year. Now that I have a little one, Halloween is probably even more fun than it's ever been! She's nuts about it too! So, when did you realize that you loved Halloween and what did you do about it? 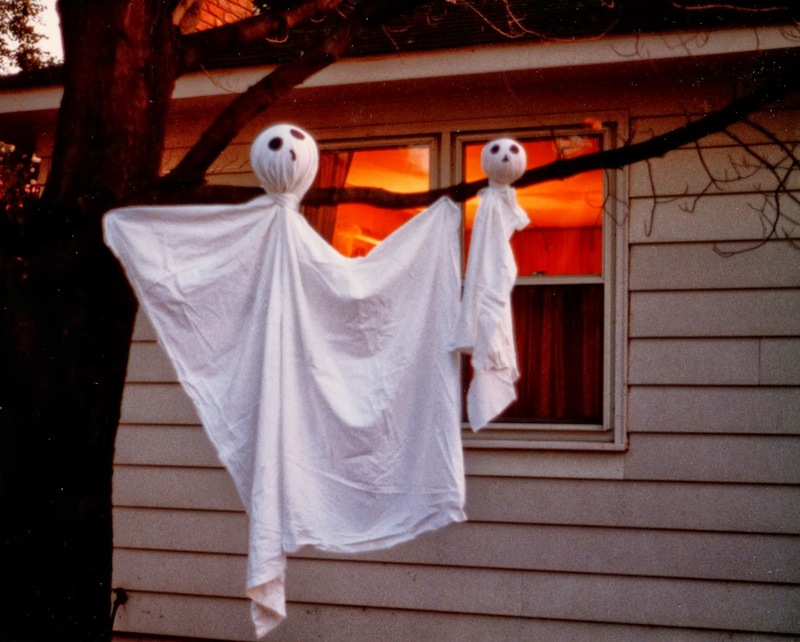 Share a story about your worst Halloween with us, or perhaps a tale of the year when you reclaimed Halloween? Remember that if you comment you will be entered into a contest for an amazing surprise prize package with cool stuff from the Harvey Mercheum, Cool & Collected, and this girl who keeps calling me and wanting me to send people old VHS tapes she found in an abandoned cabin! I never stopped! Its been a constant part of my life and I live day to day with Halloween around me at all times. I kind of lost track of Halloween in my early twenties. I can't even tell you why. It just sort of happened, you know, the whole "adulting thing" got in the way. I really didn't have any friends into it, so no party invites or anything. But I did always make sure to watch scary movies on the day of Halloween. At 30, I had my daughter, and my love of the holiday came screaming back with a vengeance! I have two kids now. My daughter is the mini me, wanting the full makeup and hair job. Loving the gory and scary and macabre. My son, he is more subdued. Doesn't love the scary part so much. I keep some Halloween decor up year round. I've never met a pumpkin I didn't like. I am a horror movie junkie. Yep, I think I'm a Halloween lover for sure! As one of the contributors, I am not eligible to win the contest, but I did want to say that I fell in love with Halloween a little more than a decade ago, when we moved into our house. We had over 300 kids that first year! I am actually enjoying Halloween much more now, as an adult, giving out treats than I ever did as a child asking for them...and yes, we sometimes wear costumes while we give stuff out! I loved Halloween as a kid. Some of my top looks from back in the day included a Ghostbuster, an Oreo Cookie and a Thundercat! I lost interest in the season during High School and started getting back into it as a DJ for parties in College. But I really regained the love of the Halloween season when I was able to take my 3 children Trick or Treating. There is nothing like seeing the anxious excitement of a kid getting ready for scares and treats on Halloween! When I was out at the mall one day, and saw a sweet Halloween costume store. It took me back to all those years as a kid where I dressed up as my favorite hero or villain that enthralled me that particular year. When my daughter was born.While we don't go overboard now with Halloween ,I made sure that my daughter got to enjoy It for her first few years. 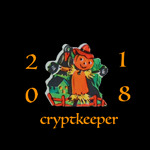 For me it was my first year as a Countdown To Halloween Crypt Keeper 2013, it was my daughter's first Halloween and I was soaking up Halloween goodness and posting every single day for the countdown. Then, I was back for more as an official Creeper with the 13 Days of Creepmas. I was pretty much hooked again.